Public Debate: The question: Was warfare a creative force in early social evolution? The question: Was warfare a creative force in early social evolution? 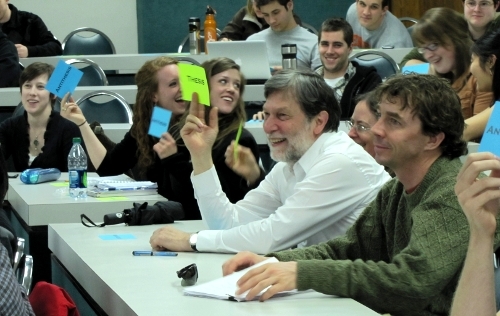 Following a lively debate on the role of warfare in early social evolution, a sea of hands waving blue cards with the words "anti-thesis" indicated that the majority of the audience believed the antithesis debaters had won the day: that is, other evolutionary mechanisms, and not warfare alone, hastened the rise of highly complex societies. The debate, held Feb. 8, 2012, in the University of Tennessee's (UT) University Center, was designed to raise questions about how science can explain the transition from simple to complex societies. The debate's main thesis contended that warfare transformed humans from living in villages to living in huge states, building cities and civilizations, and ultimately making life more peaceful, while the antithesis argued that warfare was simply an unfortunate side-effect of the evolution of social complexity. Each spectator was given a yellow card representing the thesis and a blue card for the antithesis and were asked at the end to indicate with their cards which side had given the strongest argument. 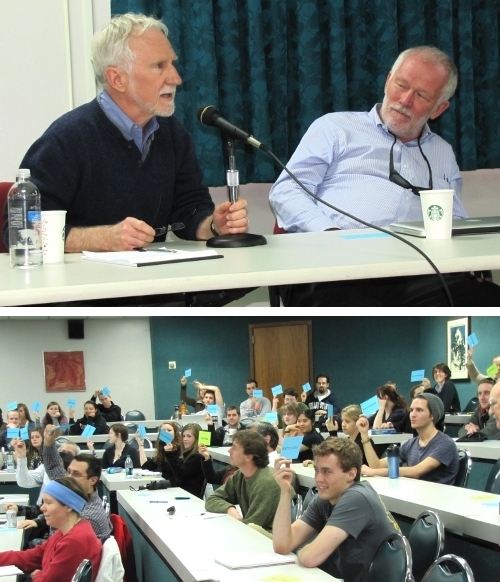 A large majority of the approximately 60 attendees voted for the antithesis. Arguing for the thesis was Peter Turchin, professor of mathematics and ecology and evolutionary biology at the University of Connecticut, and Jeremy Sabloff, an anthropologist and president of Santa Fe Institute. Arguing for the antithesis was Sander van der Leeuw, professor of archaeology and director of the School of Human Evolution and Social Change at Arizona State University and Tim Kohler, professor of archaeology at Washington State University. Moderators were Laura Fortunato, an Omidyar Fellow at the Santa Fe Institute, and Sergey Gavrilets, a professor of mathematics and ecology and evolutionary biology at UT and associate director of scientific activities at NIMBioS. Co-hosted by NIMBioS, the debate, which was broadcast live via webcast, was part of the week-long activities for UT's Darwin Day 2012. 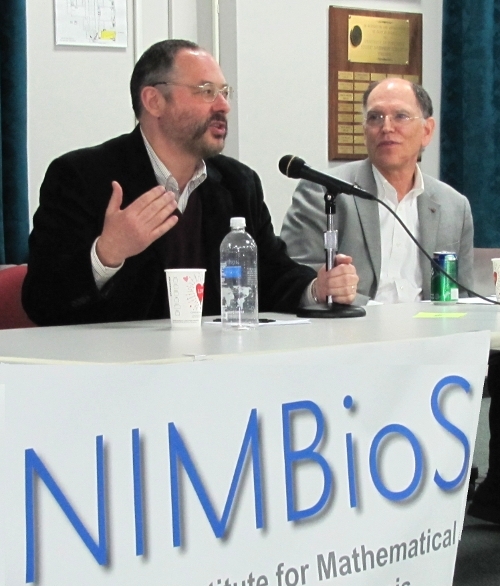 The debate was the public portion of the NIMBioS Investigative Workshop on Modeling Social Complexity, held Feb. 6-8 at NIMBioS. You can view the debate in its entirety here. (Clockwise from left) Peter Turchin (left) and Jeremy Sabloff (right) argue for the thesis. Tim Kohler (left) and Sander van der Leeuw (right) argue for the antithesis. The blue cards indicate that the antithesis had won.